The Skrill registration process is simple. With our Skrill registration guide you can create a fully functional new or second currency Skrill account in just a couple of minutes. up to 100 EUR VIP Bonus. 0.3% Bonus for your Skrill transfers every month. Register for Skrill with the following promotion link and you will earn an additional $15 Skrill signup bonus. Choose your country of residence and preferred currency for your personal Skrill account. Make sure to choose the currency that you will use for your main transactions with Skrill MasterCard or to Skrill merchants. Your new Skrill account will now be created and ready to use. Please make sure to join our additional eWallet-Optimizer Program for FREE to enjoy all additional benefits and services. To start your Skrill account verification, please login to your account and upload your documents directly from within it. To fully verify your account you need to upload a copy of your passport or ID with both sides and all four corners visible, a selfie of your face holding a handwritten note with “Skrill” and the date of the verification process next to it as well as a document which verifies your address (like a utility bill) – our clients can directly upload their documents – no deposit or webcam needed! When your Skrill account is fully verified, you should then join our Skrill VIP Promotion that will earn you up to 100 EUR Cash Bonus. Please note that this cashback is paid by Skrill and in addition to your monthly eWallet-Optimizer bonus. As soon as you have transferred more than 3,000 EUR within 30 days to merchants, please use our Skrill VIP Upgrade Tool to get your account upgraded within 1-2 business days easily. You will receive our eWallet-Optimizer Bonus every month between 15th and 20th, paid in EUR or USD, right into your account. As Skrill Silver VIP or higher, you are able to register additional currency accounts. Skrill Silver VIPs are allowed to have two currency accounts at the same time, Skrill gold VIPs can have three and Skrill Diamond VIPs can even have four Skrill currency accounts the same time. Before proceeding with your additional Skrill registration for another currency account, please make sure you fulfill these requirements, otherwise your new Skrill account would be automatically suspended. 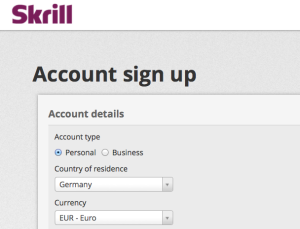 Enter your account data with your new preferred Skrill account currency. Every Skrill account is linked to one email address, so please choose another email address to the one you chose for your main Skrill account. You might also need to enter a different last phone number digit that will be corrected by our Skrill support later on. When you are done with the new Skrill registration, please do not forget to send us your new Skrill account data, so we can ensure this new Skrill account is also part of our additional eWallet-Optimizer program as well. Please note that the Skrill system will most likely automatically freeze your new account. To unlock your 2nd currency account, please send an email to vip@skrill.com to request the activation of your 2nd currency account. The Skrill VIP team will then transfer your verification and VIP upgrade from your 1st account and your new account will be ready within 1 day. Once your new Skrill account is linked to your old one, you can also order a new Skrill MasterCard for free for your new account. Make sure to hit the required transfer amounts to maintain your Skrill VIP status and to benefit from our monthly eWallet-Optimizer bonus. If you need to register another Skrill currency account instead of your actual one, please follow the instructions below. By following all steps, you will NOT need to verify your account again and you will become member of our free additional Skrill Bonus Program. Log into your existing Skrill account. Transfer any funds left to a friend of yours or withdraw them before you proceed so the account is completely empty. Go to your account → “Account Settings” and click “close” at the lower right corner to close your current Skrill account. Enter your address and preferred new Skrill currency for your Skrill account and use a different email address and phone number. Our Skrill support will be able to correct this manually later on. Your new Skrill account will now be created and ready to use. Please enter your new Skrill account details to join our additional eWallet-Optimizer Program for FREE to enjoy all additional benefits and services. Please note that your new accounts needs to be fully verified again. To start your Skrill account verification, please login to your account and upload your documents directly from within it. To fully verify your account you need to upload a copy of your passport or ID with both sides and all four corners visible, a selfie of your face holding a handwritten note with “Skrill” and the date of the verification process next to it as well as a document which verifies your address (like a utility bill) – our clients can directly upload their documents – no deposit or webcam needed! In most cases, that’s it and you can enjoy your new Skrill currency account with hopefully less future exchange fees. Sometimes, you need to contact the support again about old bank accounts that were linked with your old Skrill account. If so, please send another email to our Skrill support team at ambassador@skrill.com and they will take care of it. If you have any questions or problems with your Skrill Registration or about our free Skrill Bonus Program, please do not hesitate to contact us . 2 Send the data of your new account below to join our FREE Skrill Bonus Program. Where can I find my account ID? Unfortunately, you have not transferred enough to reach Bronze VIP Status. We will be able to get your Skrill account upgraded to Bronze VIP status. 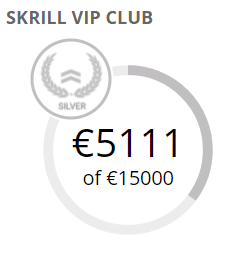 We will be able to get your Skrill account upgraded to Silver VIP status. We will be able to get your Skrill account upgraded to Gold VIP status. We will be able to get your Skrill account upgraded to Diamond VIP status. 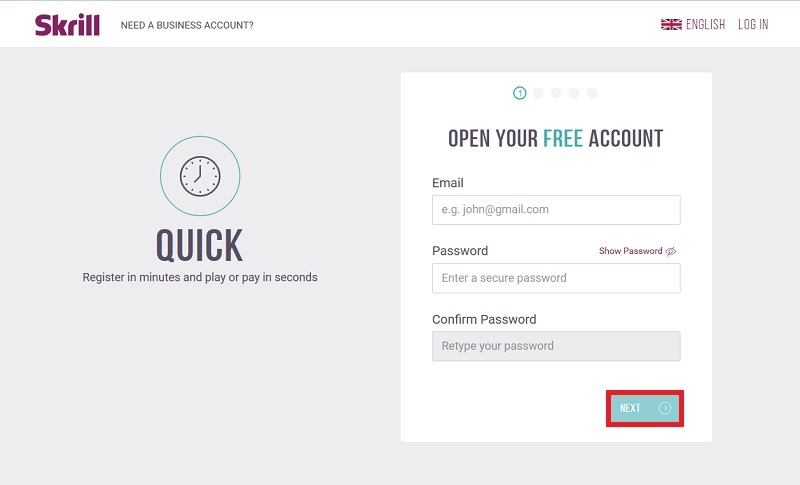 2 Send the data of your new account on the left to join our FREE Skrill Bonus Program.